Map representing atmospheric conditions observed in a region at a given time. Zone characterized by relatively high pressure that decreases as a function of the distance from its center. 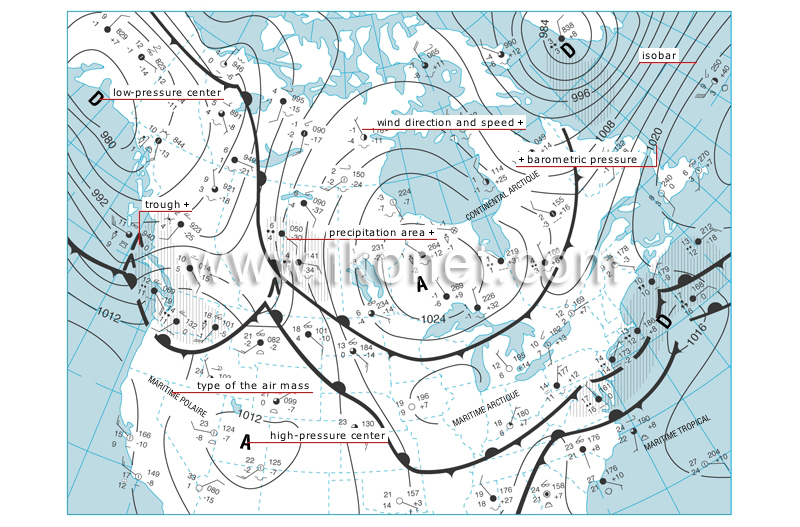 Air mass: a vast moving body of air; it takes on the climatic characteristics of the region lying below it. Elongated zone in which atmospheric pressure is relatively low. Zone in which atmospheric water content condenses and falls from the clouds in liquid or solid form. Zone characterized by relatively low pressure that increases as a function of distance from its center. Measurement of the force that air exerts at a given point on the Earth’s surface; it is expressed in millibars. Curve connecting the points on the Earth’s surface that have the same atmospheric pressure.